I’m glad I took notes because after I hung up all I could hear repeated in my ears was: an inoperable tumour … palliative care … wish I had better news … she’s had a good long life … we will know which of the four tumours it is after the weekend. None of these things can be unheard. There were other long words and more conversation. I asked some questions. The vet answered, but I don’t know that I heard too much that made sense. None of it makes sense. She loves to rifle through the garbage. Surely she just inhaled something that got stuck in her nostril? That was what was causing her to have issues of late. They would take the foreign body out and she would be back to normal. They can’t take a tumour out. Not this one. Not because of where it is. Or what it is. Or how old she is. Or the fact that these types of tumours are death sentences by the time they are found. I only got her yesterday. It seems like that and yet I can’t imagine my adult life without her. She has been my soul mate, my best friend, my source of unconditional love and companionship, my therapy dog throughout the rollercoaster of the past decade. I am in shock. I am horrified. I am crushed and overwhelmed. I want the world to stop and I want to go back in time an hour. Or two. Or a year. Yes, a year. I want to travel backwards in time a year and take her to the vet as soon as she sneezes more than once a day and find it when it is a spec and have it removed. And if they can’t find anything a year ago, I will take her again eleven months ago, and ten months ago. As far ago as I need to. Blank. That’s what I feel. Actually, I don’t know how to feel. Someone else should probably feel for me because although I can see my fingers moving on the keyboard, I don’t feel like they are attached to me. I feel like this is some alternate universe and this is all happening to someone else. What happens when the vet delivers such devastating news about your beloved dog? Does the world really just keep turning? Thankfully our favourite vet nurse was there when I arrived to pick Bella up. I managed to get through the fact that I wanted to pay the gap and have them claim the rest from our insurance … only just. She said to me that she hadn’t expected today’s outcome either. As soon as the other nurse brought her up to me I sat on the floor and held my puppy and started to cry. Everyone in the waiting room gave me the look I’ve given before when people walk out in tears with their fuzzy loves. The look that says we feel for you but we are sure glad we aren’t in your shoes. In the past few hours,I have cried buckets of tears into her fur. I have held onto those beautiful velvet ears and kissed them. I have told her what an amazing friend she has been to me. I’ve told her that I don’t want to be without her but that my gorgeous bright puppy with the happiest tail on earth just needs to let me know. I don’t want her to be in pain. I’d never want that for her. For now, I need to prepare myself. Prepare Love Bug. Prepare Beary. As much as I can. I honestly don’t think there really is any way to be able to truly prepare for losing your family. My heart is starting to shatter and there is nothing I can do to stop it. For now, I’m going to breathe in those paws that smell like dirt, sunshine and popcorn. I’m going to tell her I love her every moment of every day. I’m going to love hearing the clip clip clip of her paws on the floorboards as she wanders to see where I am. I’m going to enjoy opening the door and seeing her on the other side, her happy tail wagging, the gift of her favourite toy in her mouth for me as she has done every time she has greeted me in the past 11 and a half years. All four of us are going to sleep in my bed tonight. I imagine we will all sleep together for the foreseeable future. Beary spent a considerable amount of time sniffing Bella’s points where she’d had a drip and needle. And her snout. He’s been sniffing her snout for a while now. Anyone who lives with more than one animal knows that they know. How long had he been trying to tell me? We settle into bed. A jumble of snuggled up limbs, tears, furs and varying depths of breath. We sleep fitfully but all together. None of us wanted to get out of bed, it was as if the moment one of our feet/paws touched the floor everything would be real again. Love Bug and I didn’t want to leave the house. Adulting is the last thing I felt like doing. Obviously, I don’t want Bella to be in any pain. She actually flinched and pulled away from me when I touched her snout this morning. I understand that she is probably still hurting from being poked and prodded under anaesthetic yesterday, but it absolutely broke me. 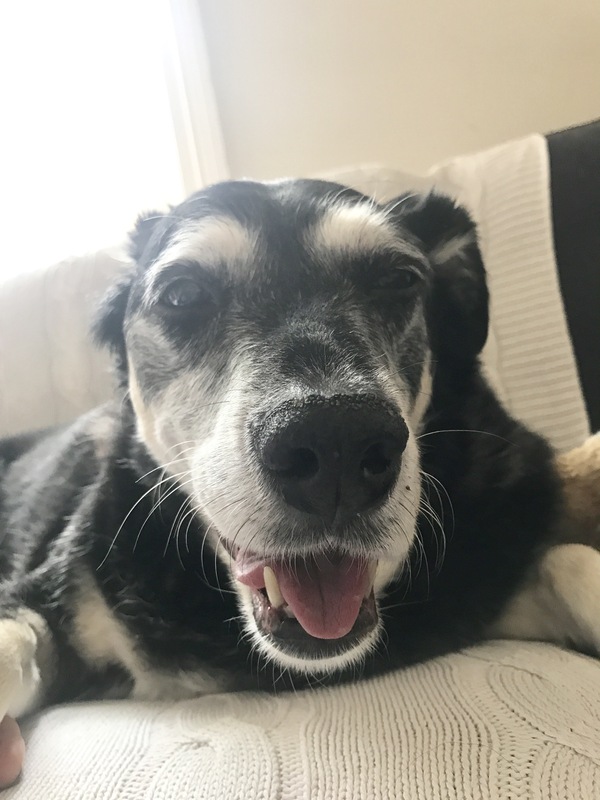 I spoke to a friend who said goodbye to her beloved dog late last year and asked her how I prepare myself. She said you can’t. The answer I expected but also feared most. She also said that having another dog really helps provide comfort during your time of grief. She also said this “we had the most awesome bond and she had an incredible life – darling Bella is equally as lucky”. Work was hard. I don’t know how many times I wished I could call Beary to check in on Bella. Or how many times I cried. I want to be at home with my fuzzy loves. I plan to be by her side as much as I can be for as long as we’ve got. The wait for pathology results on Monday seems interminable. At least then I will hopefully have some idea of how long we have. However long that is, it will never feel long enough. So sorry to hear about Bella. She has friends all over the world and we will all miss her. We are praying for all of you – that the time you still have together is full of joy – and that it is longer than you had dared to hope for. Devastating doesn’t begin to describe this news. Prayers for your family to have strength, for the gorgeous Bella to have courage, and for her doctors to have wisdom. No matter what or how, they are and always will be with us. It’s been 17 months since our girl moved on to another world and I still put fresh water in her plate – every day. Your friend is right, nothings prepares you, but think that she is with you now, so focus on that. Every moment is a gift and it doesn’t come twice. I know that many [including doctors] believe we should be ‘realistic’, but I believe in miracles, so along with my thoughts and hugs to all of you, I wish Bella proves them wrong and recovers. I am so sorry to hear this. As you know, I am in that same space. I don’t wish this on anyone. I will keep your family in my thoughts. At one point over the weekend I had the thought at least Bella and Rumpy will have each other when the time comes. Then I reached for another box of tissues. I’m so sorry to hear this news. I can recall the day I received similar news about my cat 2 years ago. You have captured receiving that phone call, time stops.I couldn’t remember everything that was said, only the few key words that circle in you head for what feels like forever. I send much love to you, Love Bug, Bella & Beary. I’m so sorry. You will all be in my thoughts.